"This is a easy, wonderful, light yet filling meal with turkey or beef, rice and fresh veggies! Fun to eat! You will need at least eight 10-inch bamboo skewers for cooking the meat." In a medium bowl, mix together ground turkey, 1 tablespoon soy sauce, 1 teaspoon minced garlic and 2 teaspoons ginger. Form into 16 meatballs and roll into ovals. Cover and refrigerate. In a medium saucepan over medium heat, combine rice with 2 cups water. Bring to a boil, reduce heat and simmer for 20 minutes, or until rice is tender. Preheat the grill or broiler. Arrange rice, lettuce leaves, carrots, scallions, radishes and red peppers onto a serving platter or place each into a small bowl. In a medium bowl, mix together 1/3 cup soy sauce, 1/3 cup water, lemon juice, 2 teaspoons garlic, 1 tablespoon ginger, and sugar. Divide into 4 small dipping bowls. Thread two meatballs onto each 10 inch skewer. Grill or broil for 10 to 12 minutes, turning occasionally to brown all sides. If broiling, line the broiler pan with aluminum foil and drain fat after 6 minutes. To eat, place a leaf of lettuce onto the palm of your hand, spoon on a little rice, then a meat roll, and a few of the vegetables. Roll up and dip in dipping sauce or spoon sauce over. 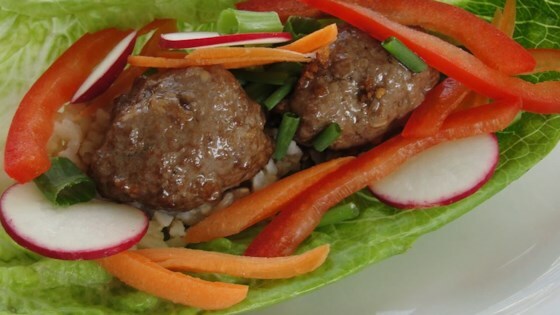 Crunchy lettuce wraps are great for a family-style dinner. This was such a fun recipe! It was a hit at a dinner party I had this weekend. Also try it with the Thai Peanut Butter Sauce found on this site.